Indrani Nooyi’s hand is a complicated one. Each of us is an interesting mix of different personality traits, and successful people usually have one or two main features that are behind their success. 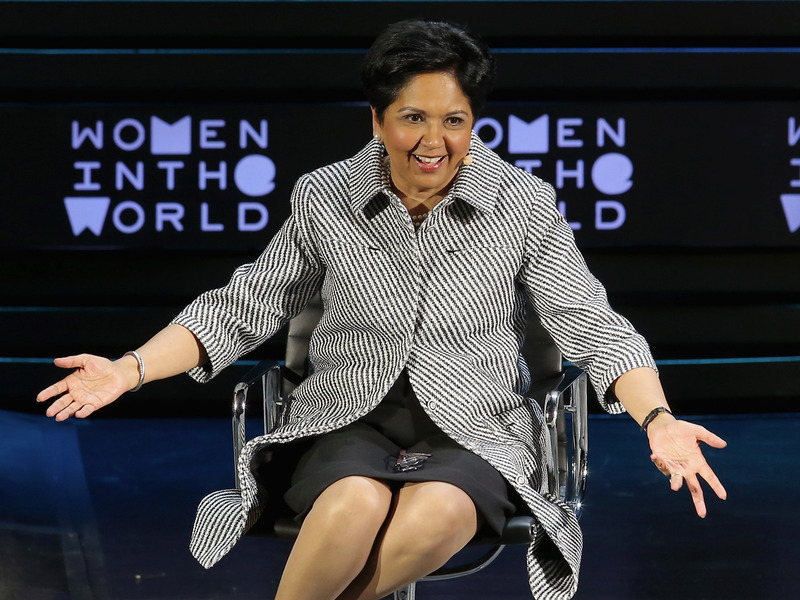 Nooyi's hand is unique as it is of a very intelligent person, but strongly influenced by the heart. These two opposing aspects of her character have managed to exist in tandem with each other. (in business and management) is her long, balanced headline showing superior organizational ability, high concentration levels and intelligence, and a long, well-shaped thumb which shows leadership ability, reasoning, willpower and a hand and lifeline which shows high energy levels. In addition, the shape and size of the top phalange of her thumb reveals a lack of stubbornness, openness to new ideas and idealism. These are good qualities in a leader. The thumb is a very important indicator of personality and what it reveals often over-rides other indicators on the hand even if they are contradictory. You can find a photo of her hands here. She has a strong, deep heartline as well, and her headline rises up a little towards it. The headline ends on upper Moon, and is long and curved. Her Moon mount is developed. This shows that she an imaginative, innovative mind. Her personality is stable and balanced, she is well centred. This is revealed by the overall shape of hand and fingers. As a businesswoman, her decisions will not be cold, but will take into account the human factor. The streak of idealism and broad perspective on life will also guide the direction of her thinking. 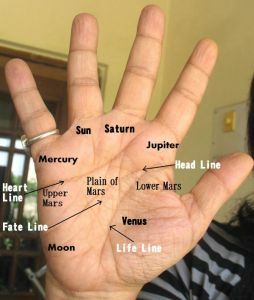 The limited development of the Venus mount if seen in combination with the shape of heartline, the developed Moon mount, the shape of her Saturn finger and the setting of her thumb means that on a personal level she can be quite detached, objective and reserved. This aspect of her personality is seen more around the age of thirty and beyond. There is also a trace of cynicism in her nature, along with the positive, idealistic mindset. Indeed, a complex personality! In conclusion one can say that it is her intelligence, the control shown by her headline and thumb and the rationality and reasoning powers shown shape by the shape of hand and fingers, that keeps her personality in balance. What I liked about her hand is that here is a person who has managed to harness her idealism and heart qualities and used them in a rational manner. Perhaps one also needs to mention that unlike many leaders she does not have a huge ego and also lacks the lust for power. As she nears the age of 50, she is less influenced by her heart, although the idealism remains. (Indrani Nooyi is a businesswoman, and heads PepsiCo. She has been ranked as one of the most powerful businesswomen in the world. If someone doesn't have the lust for power, wonder how they manage to reach such top positions... I thought money and power are the two basic things that people in top would want! DI, I think most people who get power and money aren't looking for it. They are looking to creating or expressing or at the most getting recognition. Most people who make it big are driven by a need to create. Even money moguls like Laxmi Mittal wanted to create something of his own. Power was certainly not his game. People who lust for power (lust is a strong word and means someone who wants it above all else) make poor leaders. Thanks for the suggestion purpler. Of late I am getting several suggestions for hand readings, but the hand photos have not been available. I hope I can get the hand photos of Assange. She seems to be a private type. Haven't heard too much about her. Always did wonder what type she was though. Thanks for the reading. Thanks for your comment TN. Even I was quite curious about her as one knows little of what makes these people tick! Rahul dravid is like a stoic so would love to know about his mental will power n self control..
coz it can be quite upsetting at times for a man to see people doubt his sexuality...how he deals with it..?? Yeah, those are interesting people and shall keep them on my list. Cricketer hands are not easy to find as often they have gloves on. However shall try. Purpler, I think I can manage to do Julian Assange's hand, to some extent at least. I checked on the net and found some decent photos of his right hand, and as there was a photo of him signing, he is right-handed. In all readings I only proceed if I can confirm which hand the person writes with. Anonymous, thanks for sending that link. Indeed, it is a fairly decent photo, and gives me hope that there will be others. The photo is at an angle and therefore I shall search for other photos, showing the hand facing the camera. Only that way can one get the relative shape and length of the fingers, which is an important part of my reading. I shall also search for photos where he is seen writing. Being a right-handed batsman does not necessarily mean that he writes with his right hand. The case of Sachin Tendulkar is an example. He is left handed, but plays with his right hand. I read hands of Indian and International celebs alternatively. Next will be an international personality and after that an Indian one. Before I decide to do the Indian one, I shall search for photos of Rahul Dravid's hands. Thanks again. @Nita: That's an interesting point. I always thought power was the driving factor! Its good if creating enduring structures is the driving factor for leadership. I hope at least some of our leaders have such motives.